The majestic gates of Rashtrapati Bhavan are a work of art in themselves. 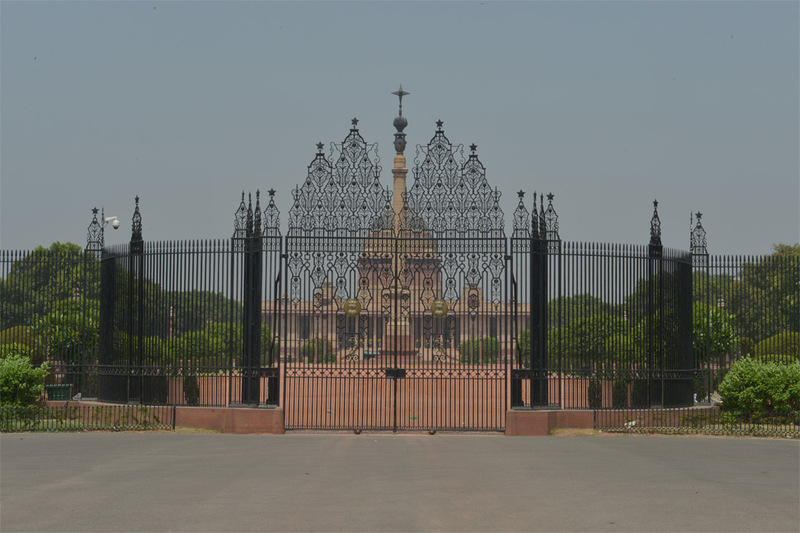 Having a width of six metres, these twenty-six feet wrought iron gates mark the boundary of the presidential palace as a part of the longer grille that runs from Gate No. 2 on the southern side till the northern most end of Rashtrapati Bhavan and is at a height of fourteen feet. The grille is perched on a two feet stone base, and gives an overall impression of an intricate black lace that has floral synthesis along with spiked uprights. 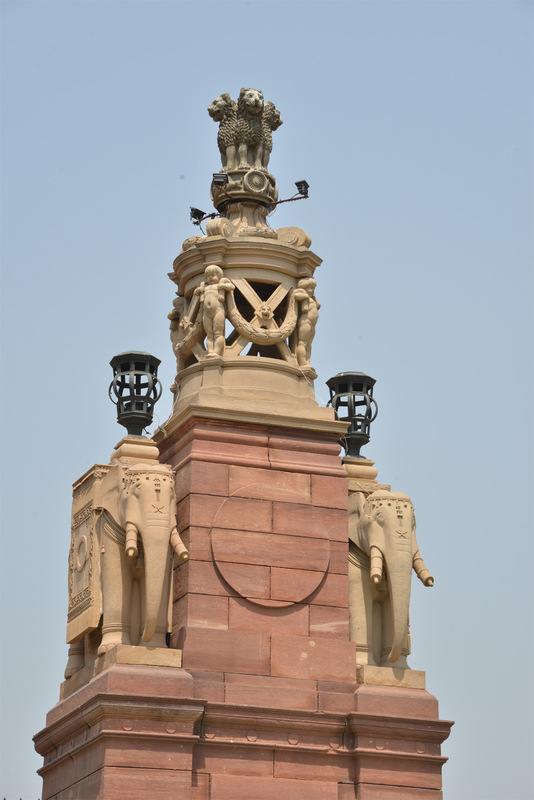 Star of India motifs can be seen adorning the Rashtrapati Bhavan gates at the top whereas the national emblem in golden hues has been affixed at the centre of the main gates. The use of elephants in architecture by Edwin Lutyens acknowledges the integral part they play in Indian culture. Revered in religion and respected for their prowess in war, the stone elephant motifs are used all along the front gates reflecting their “might” and “serenity”. As many as 38 motifs have been used atop the sandstone piers along with lanterns, floral wreaths and urns. These elephants were sculptured by Charles Sargeant Jagger, who also made the bas relief of the Jaipur Column. 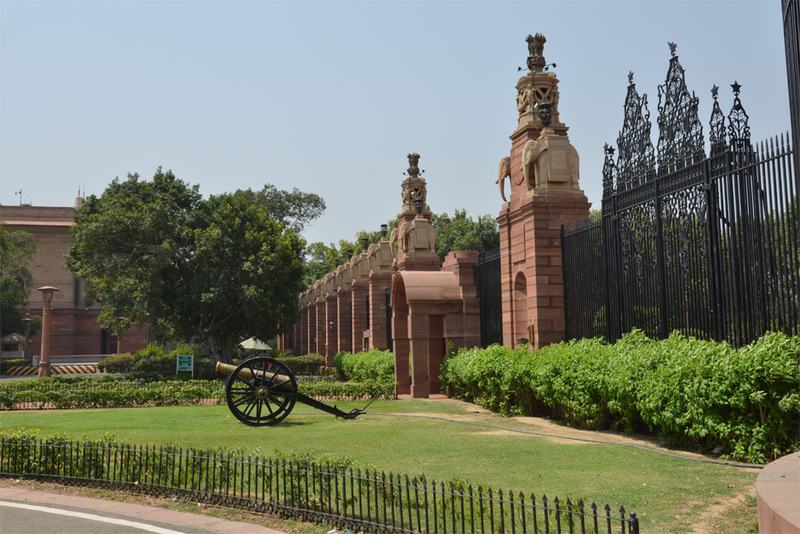 Replicas of Galloper Guns that were used during the time of British rule by the Viceroy’s Bodyguard are also displayed on both sides in front of the main gate. One can also see two red sandstone aedicules with saddle like domes along the grille. 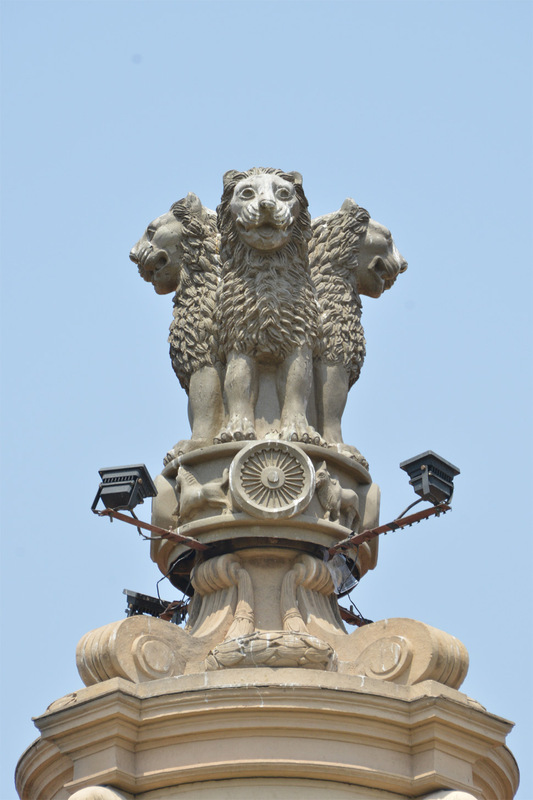 Recently, in October 2015, India’s national emblem, Emperor Ashoka’s iconic Sarnath lion capital, was fixed on the sandstone piers on either sides of the Bhavan gates, where before independence, the Imperial crown was held aloft by the lantern. A total of four emblems were installed, two on either sides of the main gate before the India-Africa Forum Summit 2015 that was held from October 26-29, 2015. 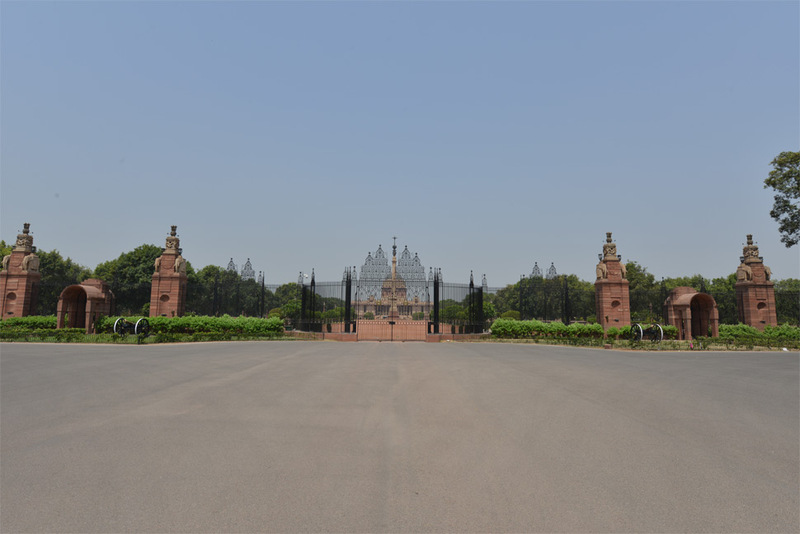 The Rashtrapati Bhavan main gate is opened only during special state occasions such as, when the President goes to Parliament House or during Republic Day celebrations when the President goes to Rajpath for viewing the parade. The great gate is also opened during the ceremonial Guard of Honour wherein the visiting Heads of State and Heads of Government drive through the main gate, where they are presented with the national salute by the President’s Bodyguard.